The unique curved shape is designed to fit the contours of the face, so powder is applied evenly and smoothly all over, leaving behind a consistent and uniform veil of luminosity. 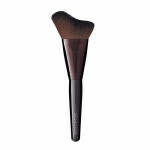 How to use: Gently swirl brush to pick up product, tapping off any excess powder. Using a light sweeping motion, apply all over the face.